th Bohol Day celebrations on Sunday, July 22, at the Bohol Tropics Resort in Tagbilaran City. Secretary to the Cabinet Leoncio B. Evasco was supposed to be one of the honorees but has declined to accept the award, saying as a public servant, he does not wish to be given an award for a work expected of him by the people. Evasco would have been given recognition in the field of Public Service – national level. 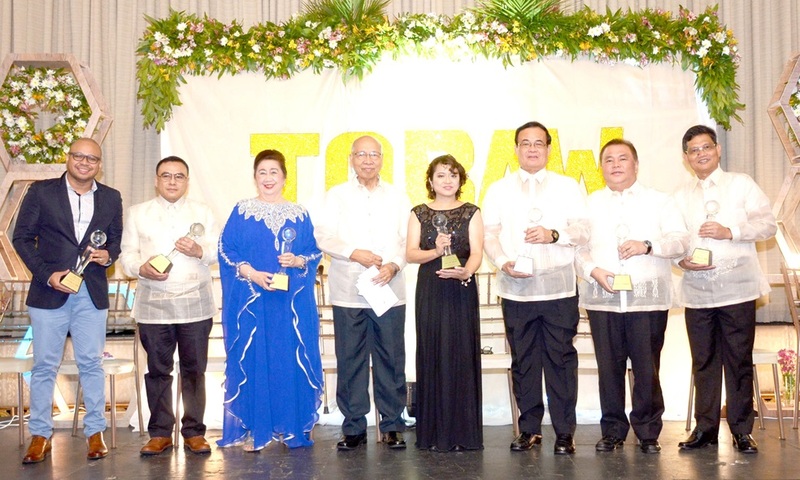 Since it was first launched in 1999, and every three years thereafter, the TOBAW awards have been given to honor Boholanos, by blood or heart, who have distinguished themselves at the forefront of their chosen fields of endeavor and significantly contributed to the well-being of the Boholano community, whether here or around the world, especially through philanthropic efforts or volunteerism. Governor Edgar Chatto who delivered a message during the awarding ceremony, called TOBAW “a celebration of excellence” as he thanked the honorees for being an inspiration to many Boholanos. “Your work gives inspiration to many Boholanos especially the young ones who are still looking for their own space in society to be able to make a difference in the lives of other people,” Chatto remarked. The awards were presented by Claire Uy-Evardone, chairman of First Consolidated Bank (FCB) and Dave Fabiosa, president of the Tigum Bolanon sa Tibuok Kalibutan (TBTK). The search for remarkable Boholanos is jointly sponsored by FCB and TBTK in cooperation with the Provincial Government, Bohol Chronicle Radio Corp., the Diocese of Tagbilaran and the Bohol Chamber of Commerce and Industry. In accepting his award, Michael Luke Mejares began by expressing gratitude to individuals who took notice of his talent when he was still performing in the local scene and kept believing in his gift as a performing artist. One such person is the chairman of the Bohol Chronicle Radio Corp. whom Mejares recognized as the one who gave him the moniker “Gary V of Bohol”. Mejares said early recognition from people of abilities inspired him to perform better, which brought him to where he is now. Another awardee in the field of business and entrepreneurship, Dr. Ed Escalona, a doctor by profession but says he is a baker by passion, tells his story of how he left the hospital where he worked in Cebu by informing his doctor-mentor that he wants to pursue a business venture in Bohol as a baker. “Being a doctor, I advocate a healthy life, and by being a baker, I foster a happy life,” said Escalona who established Bread’s Edge Corporation, the operator of Our Deli Bread bakeshops. In her acceptance speech, Francisca S. Baluyot recalls that in her years of service in her advocacy to provide free medical care to Boholanos, she was able to successfully bring in more than 200 surgical missions with 57,000 indigent beneficiaries, over 500 heart cases, and thousands of other major surgeries. “We have more than 350,000 beneficiaries from outreach medical missions and relief operations – both natural and man-made disasters. These missions are extremely difficult. However, they became a reality due to the hearts of volunteers. It is needed to help augment the health program of the country. As of date, there are only 140,000 doctors with 105 million in population in the Philippines. Here in Bohol, there are only 200 active practitioner doctors with a population of 1.3 million,” Baluyot said. Baluyot, who heads the Bohol Gift of Life, offered her sincerest thanks to the thousands of volunteer doctors, nurses, and medical staff from all over the world, while recognising the support of the Gift of Life International; the Philippine Gift of Life Board of Trustees, Directors, Advisers, Consultants; the Provincial Government of Bohol; the City Government of Tagbilaran; PAGCOR; PCSO; the AFP; the Red Cross, various hospitals, nurses, foundations, clubs, national agencies, and donors. For, his part, Rev. Fr. Florante Camacho, the awardee in the field of education, said he accepted the award in the name of all the teachers, saying that he himself is a product of a family of teachers. While Fr. Camacho was at the helm of the former Divine Word College (DWC) of Tagbilaran, as its President, that the learning institution attained university status, into what is now known as Holy Name University (HNU). He paid glowing tribute to the Society of the Divine Word (SVD) to whom he shared his award. Fr. Camacho dedicated the award to his late father and mother who inspired him to work in the apostolate of education while gave all the glory and honor to the Almighty. Teresa R. Salazar, the honoree in the field of communication and literature became known through her articles about the benefits of whole food plant-based diet for health and for the planet, and for the series of articles on the efforts to restore Bohol’s public schools, century-old churches and houses damaged during the 2013 Bohol earthquake, which helped bring national attention to these structures. “Seeing now that we are in a global society, and that we advocate inclusion, and that our awareness of the planet’s needs are coming to the forefront, I aim to infuse my own advocacy as an effective communicator,” remarked Salazar who declared that she has been a vegan for nearly two decades now. “Looking back, I was just a simple lad from this province but armed with high hopes, a strong determination to succeed, and having the value of competitiveness in my being, I was able to hurdle my way towards success. Competition isn’t always about trying to win. It’s also about getting better at what we do and who we become. The best type of competition is one where we compete against ourselves, by challenging ourselves to do better than what we’ve done previously. If we’re competitive, we can acknowledge and be satisfied with what we’ve achieved but remain motivated to continually improve. If we’re competitive yet fail at something, we’ll be able to use our competitiveness as motivation to keep going until we succeed,” Sanchez remarked. Another inspiring story of achievement is the humble beginnings of Dr. Rene N. Rollon, who was honored for his distinction in the field of science. Rep. Rene Lopez Relampagos, one of those who started serving the government at an early age became governor at the age of 31. He shared his award with his constituents whom he always wants to serve with utmost dedication. “My journey in the sphere of public service has given some of my life’s greatest joys and deepest hurts. It is my love for Bohol and the Boholanos that kept me standing up and my faith in God that kept me going. And of course, my family – the wind beneath my wings so to speak,” Relampagos said. The award, he said is an affirmation of his dedicated service to Bohol where he served as board member, vice governor, governor and congressman. He said the times he lost in elections taught him good and memorable lessons while he knows that the journey is far from over while thanking God for being faithful in guiding him while serving the Boholanos. I live, breathe and love Boholano, the awardee for public service said. Dr. Rollon, who is the head of the Aquatic Ecology Laboratory and professor of the University of the Philippines (UP), came from the island of Pitogo, now the Municipality of Pres. Carlos P. Garcia. He finished his primary education in their barangay of Gaus. The boy from the island-municipality graduated elementary with 22 others, none of whom finished college except for him. If relatives hadn’t taken him to study high school out of the island, Rollon said he would not have finished high school, which became his “bridge” to acquiring higher education at UP, and then later on to the Netherlands where he pursued several degrees, including a Ph.D., in the sciences. Engr. Valentino C. Pueblos in the field of engineering said the award is to inspire other Boholanos of his humble beginnings. Engr. Peublos said “it doesn’t matter where you come from or….. what school you attend. Your Ability is the Key to Success. He expressed pride on the world-class education in the country which he wants Filipinos to avail and recognize. Given special citation during the 2018 TOBAW awards night is a group that builds homes for the poor, called “BalaysaKabus”. BalaysaKabus puts God’s love into action aside from bringing people together, not just to build homes for the poor communities, but also to give the people in these communities hope. BalaysaKabus all started with Rufiniano Galiguer. Rufiniano, was a carpenter by trade who led a simple life. Yet with his modest means, he was determined to help others in need. He used his own resources and along with a few helpers, was able to build fourteen homes in his barangay, Tubod Monte, Jagna, for the homeless. Rufiniano was diagnosed with diabetes. In 2011, his son, Victorio, finally requested for a blessing for his father’s condition from Most Rev. Alberto Uy, DD., then parish priest of Jagna. Although the blessing did not cure his diabetes, it certainly paved the way for an awe-inspiring legacy. After visiting the Galiguers in Tubod Monte, Bishop Uy was inspired by Rufiniano’s story and asked Rufiniano to support him in continuing his works of building homes for the homeless. It was then that both parties agreed to create a cluster which Bishop Uy initially called Balay sa Kabus gikan sa Diyos. And thus began the BalaysaKabus Foundation. It was established to build houses for the poorest of the poor. “BalaysaKabus” in English means “House of the Poor.” The “poor” here refers not only to the materially poor but also to the poor children of God, those who place their trust greatly in God. Motivated by Christian charity, the foundation spends one day a week to help a poor neighbor build a decent house. Volunteers spend weekdays earn honest livings for their families. Then, on Saturday, they join the BalaysaKabus group to help build a house. Through combined efforts of Bishop Uy and the volunteers of the group, BalaysaKabus built its first home in barangay Bunga Ilaya on September 2011. The first recipient was the family of Lucia Tipactipac, an old widow who lived with her daughter. The first few volunteers of BalaysaKabus found out how Tipactipac’s family had to open umbrellas to cover themselves during rainy seasons because they didn’t have a ceiling. Though Tipactipac had already passed away, the first BalaysaKabus home is still standing strong after more than five years from its construction. In the very beginning, there were very few volunteers. It would take at least three Saturdays to finish one little house. As the organization grew, the capacity also grew. After three months of existence, the organization took two Saturdays to build a house. And then, after six months, it took one Saturday to finish a house for a poor family. The standard size of the house is 14’ x 14’, with 1 receiving room and two bedrooms. The toilet and kitchen are built outside. It costs about P32,000 worth of materials to build a house of this size for our brothers and sisters in need. To determine recipients, the barrio people submit names to the foundation. Then, the foundation screening committee goes to the recommended poor families to verify their difficult situation. They ascertain the family’s livelihood and financial status, number of children, old and sickly people, etc, and take pictures to document the situation of probable recipients. From there, the screening committee reports all the information to the Elders, and as a group, they decide who among the poor families will be the next recipients of a gift-house from the BalaysaKabus apostolate. The fundamental principle the foundation follows is: Serve first those families who are most in need, regardless of faith, religion, color or race. Although Rufiniano had already passed away, his legacy strongly lives on through BalaysaKabus that continues to build homes for its beneficiaries. FCB, during the awards night, tendered a P500,000 donation to the laudable project which is under the direct supervision of Bishop Uy.